This range can hold table tops up to 800mm in width and diameter. The central column is stained in a professional Beech finish. This product can also be used outside in good weather. 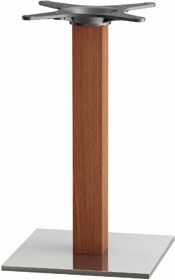 Stylish table base with a contrasting beech wood column and shiny weighted square base. This base can be mixed and matched with our wide range of professional cafe table tops.